Eltham-based Imbue Distillery are a husband and wife team that make hand-crafted gins imbued with stories (and flavours) relating to where they live. They are not afraid to play with flavours and, for example, their first product was gin infused with dandelion, prickly pear, blackberry and fennel, all foraged from the local area. Over time, they plan to expand to other spirits and liqueurs. You can buy their gin online or at: Eltham Deli; Fitzroy Cellars; Liquorologist, Balwyn North; Nillumbik Cellars, Diamond Creek; and Second Home, Eltham. Read their Local Food Directory entry. Welcome Mel and Mick! Mel and Mick would like to give away a bottle of their gin (value $80) to a randomly chosen newsletter reader. To enter the random draw, simply ‘like’ their Facebook page and then email me to say that you have done so. Clearly, it would be good for them if you also ‘shared’ their page at the same time. I know that many newsletter readers like these sorts of giveaway competitions. If you are a local food producer and would like to give something away via the newsletter, email me. Newsletter readers Kim D’Angelis and Jane Glynn have been setting up a veggie garden at Leith Park Retirement Village in St Helena. They are now looking for a couple of volunteer gardeners to help with the upkeep of the wider garden. If interested, email Kim. Three facts appear to be clear. 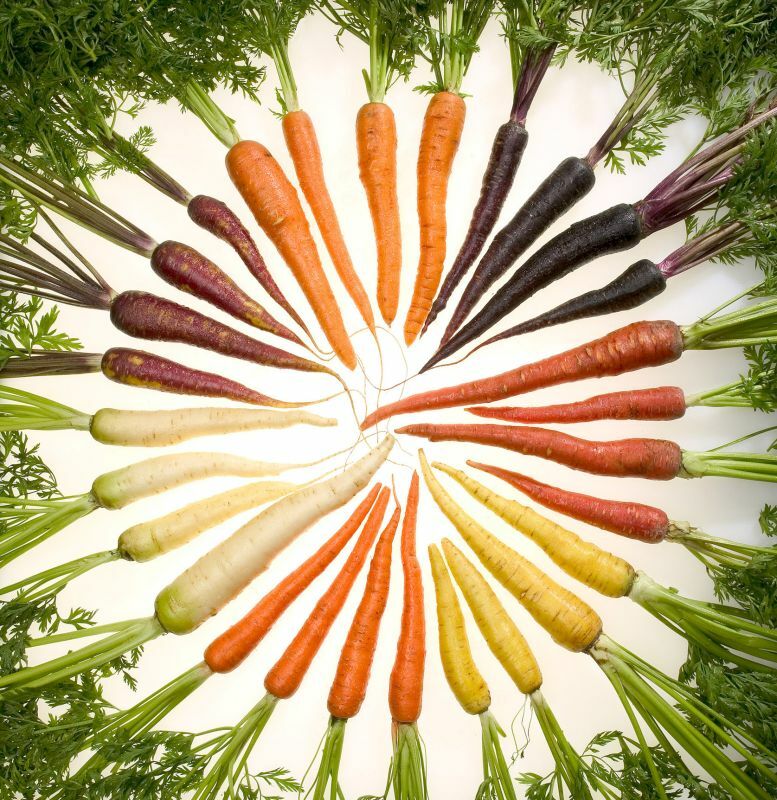 First, wild carrots were historically purple, yellow or white. Second, modern orange carrots emerged in the Netherlands in the 17th Century and are orange because of their abundance of carotenes. Third, the Netherlands in the 17th Century (and later) was ruled by the House of Orange. What is less clear is the linkage or otherwise between these three facts. Popular anecdote is that orange carrots were purposively developed as a tribute to William of Orange but Wikipedia says: “there is little evidence for this“. In researching this subject, here are a few other interesting ‘factoids’ that I found out. First, the colour is named after the fruit, rather than the other way round (before the fruit became known in England, the colour was apparently called either geoluread or geolucrog in English). Second, the House of Orange adopted the colour orange simply because the city in France from whence they came happened to have the same name as the colour. Lastly, although the House of Orange has ‘ruled’ the Netherlands for hundreds of years, the Dutch flag contains no orange (it is red, white and blue), anecdotally because the orange dye in the original flags was unstable and turned to red in the period from when they were first made until the time that the colours of the flag were officially decided. Marina’s interview with Stuart and Christine Rodda. In last week’s newsletter, we mentioned that Stuart and Christine are giving a guided tour of their garden on Saturday, 9th February, 11am-midday. Well, that tour is now sold out but they are happy to have a second tour at midday if there is sufficient interest. To register your interest in the midday tour, go to their original Eventbrite listing and join the waitlist. Why is a carrot orange and pointy? Because if it was green and round it would want to pea! What: You will learn how to make and maintain their own beeswax wraps for keeping food fresh and hygienic without the use of single use plastics such as cling-wrap. You will leave with two ready-to-use wraps. When: Thursday, 21st March, 10am-midday. What: What you will learn: which plants to grow together, and which ones not to; how to solve many common garden problems naturally; and how to construct ‘plant guilds’ (groups of plants that grow much better together). Presented by Angelo Eliades. With companion planting, by knowing which plants to grow together and which ones not to, you can grow stronger, healthier and more productive plants, improve soil quality, and reduce pests and diseases in your garden. Learn which companion plants to add to your garden to solve many common garden problems naturally, and find out how to construct ‘plant guilds’ (groups of plants that grow much better together) for more abundant harvests. When: Thursday, 21st March, 6.30-9pm. What: Buttenshaw Farm is based on organic and permaculture principles with the hope of encouraging beneficial insects and everything working in harmony. Thanks to interspersed flower plantings, native bees (including blue-banded bees), European honey bees and butterflies are residents of the garden. The household seeks to reduce their environmental impact by embracing nature, reducing waste and utilising scraps in the garden system. The productive part of the garden features fruit and nut trees, heirloom vegetables and chickens. When: Saturday, 23rd March, 10-11am and again at midday-1pm. What: An annual event to celebrate food across cultures with live music, free workshops on sustainable living, cultural performances, animal displays, giant veggie growing competition and kids activities. Also, food and craft stalls from local and organic makers and designers. When: Saturday, 23rd March, 10am-3pm. What: The festival allows you to sample some of the boutique beer and cider that Victoria has to offer, with many exhibitors being close to home. Food stalls will be in attendance, combined with entertainment. The festival is an initiative by the Rotary Club of Wandin, in conjunction with some community beer and cider lovers. When: Saturday, 23rd March, 11am-5.30pm. Cost: $16 ($37 with tasting tokens). What: Tim’s garden is all about having veggies on hand for everyday use. The property combines a more traditional and formal garden at the front with a more casual one out the back. The garden even has its own instagram page! When: Saturday, 23rd March, midday-1pm. What: This garden has been growing food for 35 years, the past 25 under Denise’s watchful eye. Located right alongside the train line, the garden includes fruit and nut trees, berries, vines and vegetables. For a relatively small space, the garden is full of fruit trees ranging from apples to apricots to avocados. A small flock of chickens add to the system underneath a giant walnut tree to the back of the property, and flowers keep bees happy year round. The 40 or so edible plants keeps the family content with vegetables year round and in good stead for preserves. When: Sunday, 24th March, 10-11am and again at midday-1pm. What: Learn how to recycle all garden and food waste, even the difficult things! This workshop will cover what materials to put into which waste recycling system and how to use the processed materials in the garden. Other topics will include cold and hot composting, worm farming and bokashi composting. All the basics will be covered, as well as tricks, tips and techniques to get faster and more efficient composting of every kind of waste. When: Sunday, 24th March, 2-4pm. What: What you will learn: crop rotation after summer veggies; growing common and uncommon winter veggies; and seed sowing techniques for winter veggies. Presented by Nicole Griffiths. You will learn how to prepare your garden for a bumper crop right through winter. They will cover what plants to plant over the cooler months and when to plant them, winter garden jobs, soil care and pest/disease management. Bring along your gardening gloves! When: Saturday, 30th March, 9.30am-12.30pm. What: Join Ben Moore from Ben’s Bees to make your own ecofriendly alternative to plastic wraps. When: Saturday, 30th March, 10am-midday. Where: Central Ringwood Community Centre. Cost: $25 (includes all materials). Bookings: by phone (9870 2602). What: Giant pumpkins, music, hot food and market stalls. There will be a selection of the region’s best homemade, homegrown artisans. They will be running cooking, art & craft and horticulture competitions. When: Saturday, 30th March, 10am-3pm. Where: Alowyn Gardens & Nursery, Yarra Glen. What: Increase your planting options and veggie yield by saving seeds from previous plants and harvests, and effectively sowing them for maximum benefit. When: Saturday, 30th March, 11.30am-1pm. When: Sunday, 31st March, 10am-5pm. What: This will be the eighth annual home harvest picnic, where catering students from Eltham High School, under the guidance of a professional chef, produce a shared meal from homegrown produce. You have three options: register as a grower ($0) – supply some of your homegrown produce and receive a prepared basket for you and up to three guests; purchase a picnic basket ($20 for two people); or bring your own picnic ($0). When: Sunday, 31st March, 4.30-8pm. What: Learn to make your own kombucha tea with Dayle Barnett and take home a scobi to get you started. Dayle is a chemistry major who often has many different brews fermenting in all corners of the house and enjoys experimenting with kombucha, jun, kefir and ginger beer. When: Sunday, 3rd March, 10.30am-midday. What: This class will cover creative lunches whether they be for work, school or on the run. They will demonstrate a variety of creative, healthy or cost saving ideas and you can sample each of the recipes. When: Tuesday, 19th March, 7.30-9pm. What: This workshop will give you some confidence to try different styles of home preserving. You will be concentrating on making jams with seasonal and frozen fruit. Bring your apron, your questions and your appetite. All materials supplied. When: Wednesday, 20th March, 6.30-9pm. Bookings: by phone (9899 7660). What: Hilda and Laurie, authors of Wow, It’s Italian, will show you how to make the perfect pasta using the correct ratio of liquid to flour. When: Thursday, 21st March, 10.30am-midday. When: Thursday, 21st March, 11am-midday. What: Enjoy 3 tasting size courses cooked by chef Bek McMillan, from Gourmet Living, who will demonstrate step by step. All recipes are included. Menu: roast pumpkin wedges; harissa chicken lettuce cups; and honey bananas. When: Thursday, 21st March, 7-9pm. What: Menu: naan bread with chana masala. Cook Indian by the creek came into existence with the idea of breaking the myth that Indian cooking is complex and difficult to nail. In each session, they will share their traditional recipes and go through the step by step cooking process. The classes are held in a private kitchen. When: Friday, 22nd March, 6-8pm. What: Menu: samosa and chutney. Cook Indian by the creek came into existence with the idea of breaking the myth that Indian cooking is complex and difficult to nail. In each session, they will share their traditional recipes and go through the step by step cooking process. The classes are held in a private kitchen. When: Friday, 29th March, 6-7.30pm. What: Make the most of the seasonal bounty of fruit and vegetables and learn techniques of how to safely make pickles, jams and bottled fruit. This workshop will be run by Maria Ciavarella from My Green Garden. When: Saturday, 23rd March, 1-3.30pm. What: Knowing different ways of processing and preserving the crops you’re harvesting is essential for budding productive gardeners. Leah will walk you through many of the techniques that she uses in her kitchen to extend the shelf-life of what she harvests including saucing, pickling, dehydrating, freezing and drying. She’ll share some of her tips and tricks for making garden delicacies such as dehydrated figs, cordials, sorbets and ice cream. When: Sunday, 24th March, 10-11.30am. What: What you will learn: how to cultivate, feed and keep your ferments for long and short term use; how to assess pH, sugar and alcohol levels; and relevant food safety and sanitisation for fermenting. What you will get: comprehensive workshop notes and references/further reading; your own vegetables ferments to take home; and a sampling of fermented food. Lacto-fermentation is a healthful, safe, low energy method of food preservation. Molly Bryson will show you how to make kimchi and kombucha. When: Saturday, 30th March, 9-11.30am. Where: Bee Sustainable, Brunswick East. What: Tutor Taariq Hassan. Learn how to cook a healthy North West Indian vegetarian meal from scratch using authentic ingredients. The menu will include: daal tadka (spiced lentils); raita (yoghurt based dip); muttar pulao (basmati rice with peas and cumin seeds); chapatti (flat bread); and seviyan (a milk-based dessert). When: Saturday, 30th March, 10.30am-1.30pm. Where: Living & Learning Nillumbik at Diamond Creek. Planning your winter veggie patch: Wednesday, 6th February, 6-7.30pm. Growing community with social enterprise: Thursday, 7th February, 10.30am-midday. The art of espalier: Thursday, 7th February, 6.30-9pm. Indigenous plants for food/fibre/medicine: Thursday, 7th February, 7-8.30pm. Set up and maintain a worm farm: Friday, 8th February, 11am-midday. Summer fruit tree pruning: Saturday, 9th February, 9am-1pm. Poppy’s patch (garden guided tour): Saturday, 9th February, 10-11am. Coburg secret garden (garden guided tour): Saturday, 9th February, 10-11am. Greg’s garden – productive and organic backyard: Saturday, 9th February, 10-11am. Bee hive tour: Saturday, 9th February, 10.30am-12.30pm. Stuart and Christine’s garden (garden guided tour): Saturday, 9th February, 11am-midday. Green at Kathleen – preparing for autumn harvest: Saturday, 9th February, 11.30am-1pm. Vegan vegastation yumcha! : Saturday, 9th February, 11.30am-4.30pm. Coburg secret garden: Saturday, 9th February, midday-1pm. Greg’s garden – productive and organic backyard: Saturday, 9th February, midday-1pm. Coburg secret garden: Saturday, 9th February, 2-3pm. Greg’s garden – productive and organic backyard: Saturday, 9th February, 2-3pm. Devita Davison – FoodLab Detroit: Sunday, 10th February, 10-11am. Farm play: Tuesday, 12th February, 10am-midday. Bush skills and kids farming: Tuesday, 12th February, 4-5.30pm. Summer fruit tree maintenance: Thursday, 14th February, 6.30-9pm. Preparing your garden for Autumn harvest: Thursday, 14th February, 7-8.30pm. GreenMe Brunswick tour: Friday, 15th February, 1-4pm. Attracting native bees: Saturday, 16th February, 10-11.30am. Edible weeds of Melbourne: Saturday, 16th February, 10am-midday. Composting at home workshop: Saturday, 16th February, 12.30-2pm. Home composting workshop: Saturday, 16th February, 2-4.30pm. The art of watering: Saturday, 16th February, 3-4.30pm. Pop up garlic farmer information evening: Saturday, 16th February, 5-8pm. Farmer to table dinner: Saturday, 16th February, 7-10pm. Weed cold composting: Sunday, 17th February, 9.30-10am. Weed cold composting: Sunday, 17th February, 11.30am-12.30pm. Farm play: Tuesday, 19th February, 10am-midday. Bush skills and kids farming: Tuesday, 19th February, 4-5.30pm. Backyard beekeeping with Benedict Hughes: Tuesday, 19th February, 6-7.30pm. Seed saving: Tuesday, 19th February, 6.30-8.30pm. Growing bountiful harvests in small spaces: Wednesday, 20th February, 6.15-8pm. Healthy productive compost and worms: Thursday, 21st February, 6.30-9pm. Bee hive tour: Saturday, 23rd February, 10.30am-12.30pm. Introduction to permaculture (two sessions): Saturday, 23rd February and Sunday, 24th February, both 10am-4pm. Brewers Feast Festival: Saturday, 23rd February, 11.30am-8pm. Seed saving workshop at The Plummery: Sunday, 24th February, starting at 10am. Weed composting and veggie swap: Sunday, 24th February, 10.30am-midday. Brewers Feast Festival: Sunday, 24th February, 11am-5pm. Heritage apple tasting: Sunday, 24th February, 5-7pm. Introduction to horticulture – 9 session course: every Monday for 9 weeks, starting 25th February, 9.30am-3pm. Farm play: Tuesday, 26th February, 10am-midday. Bush skills and kids farming: Tuesday, 26th February, 4-5.30pm. Growing your veggies: Tuesday, 26th February, 6.30-8.30pm. Medicinal herbs workshop: Wednesday, 27th February, 6.30-8pm. Summer fruit tree maintenance: Thursday, 28th February, 6.30-9pm. Farm play: Tuesday, 5th March, 10am-midday. Bush skills and kids farming: Tuesday, 5th March, 4-5.30pm. The practical beekeeper: Wednesday, 6th March, 1-2.30pm. Growing fruit and veggies in small spaces: Thursday, 7th March, 6.30-9pm. Vegan vegastation yumcha! : Saturday, 9th March, 11.30am-4.30pm. The Beet Retreat – healthy meals on a budget: Thursday, 7th February, 6.30-8.30pm. Cooking for the Lunar New Year: Thursday, 7th February, 7-8.30pm. Cooking master class – all about salads: Thursday, 7th February, 7-9pm. Shio koji making and cooking: Friday, 8th February, 11am-1.30pm. Cook Indian by the creek: Friday, 8th February, 6-7.30pm. Fermenting for the future: Saturday, 9th February, 10am-12.30pm. Amazake making and cooking: Saturday, 9th February, 11am-1.30pm. Thermomix lunchbox workshop: Sunday, 10th February, 2-4pm. Kombucha and gut health: Tuesday, 12th February, 7-8.30pm. Ice cream making class (thermomix): Tuesday, 12th February, 7.30-9pm. Cooking for healthy minds (8 sessions): Tuesdays from 12th February to 2nd April (8 weeks), 1.30-3.30pm. Food know how – zero waste cooking: Wednesday, 13th February, 6-8pm. Summer preserves: Saturday, 16th February, 9.30am-12.30pm. Getting started with sourdough: Saturday, 16th February, 10.30-11.30am. Mozzarella and ricotta cheesemaking workshop: Sunday, 17th February, midday-2.30pm. Turkish cooking demonstration: Monday, 18th February, 7-8pm. Tomato relish workshop: Thursday, 21st February, 11am-midday. The Beet Retreat – healthy meals on a budget: Thursday, 21st February, 6.30-8.30pm. Cook Indian by the creek: Friday, 22nd February, 6-7.45pm. No waste cooking workshop: Sunday, 24th February, 10am-2pm. The Beet Retreat – eating vegan on a budget (4 hour): Sunday, 24th February, midday-4pm. Preserving your harvest workshop at The Plummery: Sunday, 24th February, starting at 1pm. Taste of Malaysia (Peranakan): Tuesday, 26th February, 10am-midday. Cook Indian by the creek: Friday, 1st March, 6-7.45pm. Thermomix Flavours of India – demonstration-style cooking class: Friday, 1st March, 6.30-8.30pm. Decorating kids cakes with Emelia Jackson: Friday, 1st March, 7-9pm. Mozzarella and ricotta cheesemaking workshop: Saturday, 2nd March, 9-11.30am. Nuka zuke – rice bran pickling: Saturday, 2nd March, 11am-1pm. Preserving summer produce: Sunday, 3rd March, 10am-1pm. Kombucha tea workshop: Sunday, 3rd March, 10.30am-midday. Shio koji making and cooking: Sunday, 3rd March, 11am-1.30pm. Mozzarella and ricotta cheesemaking workshop: Sunday, 3rd March, midday-2.30pm. The Beet Retreat – ‘practically raw’ gluten free vegan un-cooking class (4 hour): Sunday, 3rd March, midday-4pm. No Waste Cook Club: Saturday, 2nd March, 10am-midday. Cooking for baby and toddler (thermomix): Tuesday, 5th March, 7.30-9pm. The Beet Retreat – ‘practically raw’ gluten free vegan un-cooking class: Thursday, 7th March, 6.30-8.30pm. Cooking master class – Italian feast: Thursday, 7th March, 7-9pm. Cook Indian by the creek: Friday, 8th March, 6-7.45pm. Miso paste making: Saturday, 9th March, 11am-1.30pm. Sourdough bread workshop: Saturday, 9th March, 9-11.30am.